In 2011, my wife, Danielle, & I were honored to lead a team of wonderful folks to Swaziland, Africa. This was our second chance to travel to Swaziland to visit great friends and spend our brief time assisting with some of the Children's HopeChest and Adventures In Missions efforts in this beautiful country. We planned to spend the bulk of our time at two carepoints, Mangwaneni and Bheveni. We started our trip at Mangwaneni Carepoint, commonly referred to as "The Dump" as it's located directly across the road from the Manzini city trash dump. At that time there were over 100 children who lived within walking distance of the carepoint and the dump, and would regularly come to Mangwaneni for daily meals and care. Your nose continually reminds you when you're at the dump as the scent of the garbage and decay is overpowering. Much like a dirty diaper you cannot ignore, the wind carries awful smells from across the road throughout the day. You never really grow immune to its powerful odor, evidenced by the wincing reaction of the children when a particularly pungent breeze wafts into the area. The first day there I met a young girl who befriended me and proceeded to lead me around the area of the carepoint. The area is a dusty, rock-filled, red dirt compound with lines of crumbling rock, some half buried car tires, and a fenced in football pitch (soccer field) that was used continually be the elementary aged boys and girls. This little girl, whose name I'm ashamed I don't remember but whom I won't forget, seemed to latch onto me early in our visit. We see this happen often when we have the chance to visit carepoints; children often will pick out specific trip participants right away who they really connect and hang with throughout the visit. In this case, she chose me. She carried a bright, slightly shy, smile as she tugged on my hand and led me throughout the tires, bricks, and red tinted gravel that marked her playground. Her endless energy kept me on the run. I was surprised at her ability to run and climb and basically wear me out that first day! You see, this little one has an extra dose of challenge in her life at The Dump. She was short a leg. Half a leg actually. 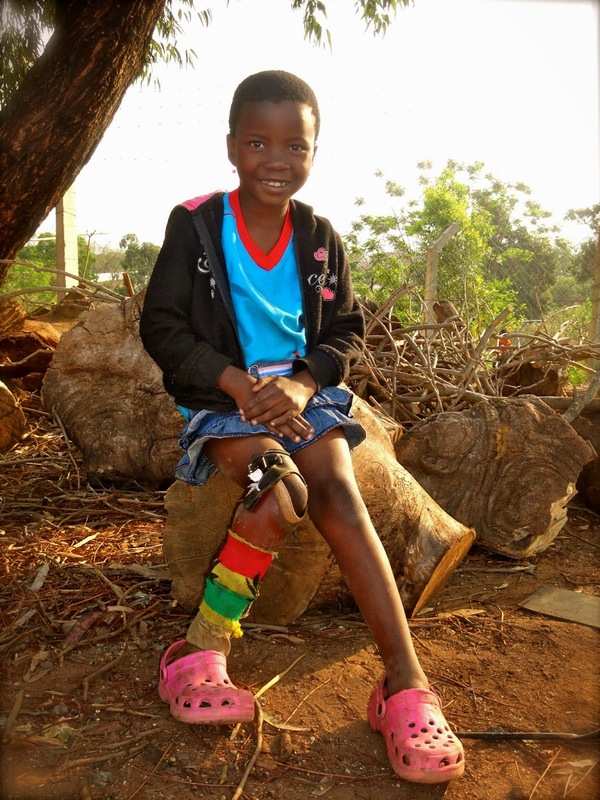 Her prosthetic limb connected at her right knee. Yet, or in spite of, she seemed to able to keep up and out-pace most anyone around. And for some reason I'll likely never know I was her friend those days at Mangwaneni. On the afternoon of our first day at Mangwaneni our budding friendship, and trust, was put to the test. I was again being pulled through the playground, along the mud packed gravel with scents of rotten waste swirling about. We started playing a bit more physically along with some of the other children. Basically I would chase and tickle one or more of the children. They would laugh and squeal in mock-fright, run a bit away, and return on the run for more playful fun! A tickle game that most parents can fondly recall playing with their own children, this little game could go for hours and hours with these children unaccustomed to adults who will just play with them. As the group of children and I continued to play and laugh and rough-house around the playground, somehow my little friend, a couple of other kids, and myself found ourselves tangled together and falling to the hard, rough, gravel. I was able to catch myself pretty well and thankfully didn't land atop any of the children. Unfortunately my one-legged little friend wasn't able to suspend her fall as well. She went down pretty hard and in a tangled heap of kids. I shushed the commotion and bent down to help her back up. She turned and I won't forget the look on her face, a look I understood without the need for translated language or words at all. Fear. Big tears, the crocodile kind, quickly formed in the corners of her eyes. As gently as possible I helped her to stand, balancing mostly on her good leg. I didn't know what to do and she could not tell me, but by the look on her face I was concerned she thought I had tried to push her down or intentionally hurt her in some way. The pit forming in my own stomach was horrible as I recognized her confusion and pain, and realized there was little I could do in the moment to bring comfort or understanding. Tears began to quietly stream down her strong cheeks as I walked her hand-in-hand to the lead teacher at the carepoint. I did my best to explain what had happened, along with my concern this young one seemed quite afraid of me. I continued to apologize in hopes the teacher understood and could communicate this better to my friend. The teacher seemed to understand and took the little girl in her arms to fulfill a parental role needed in the moment. I felt like a dope as I returned to the play area and activities of the carepoint. The rest of the day went quickly, though I didn't see much of young, one-legged, friend as the day wrapped up. The teacher came to me late in the day and explained that when my friend had fallen, her prosthetic had twisted against her knee and was extremely painful. She said that all was well as the children were departing to their shacks and huts surrounding Mangwaneni and The Dump. We returned to The Dump the next day for more play and connection with the children. I was delighted to be greeted once again by my little friend. She was quick to grab my hand and lead me around the rest of the day! At one point later that day, when our cameras were out and the children were posing, she surprised me again. We were taking pictures of several of the children, one by one, and turning the digital camera back around to show each their own photo. The kids would often photobomb, or "picture rob" as my dad likes to call it, one another and cause the process to take much longer, and be a bit more fun, than really needed. When it was her turn to pose, my little friend sat down in front of me and the camera and sort of crossed her legs. Then she did something I didn't expect - she quickly removed her prosthetic for the photo. I don't know why, but it seemed like she wanted to be sure I saw just her, and the plastic leg may have been getting in the way. So she removed it and showed her new friend, me, the scar of skin tightly stretched over a bit of bone. 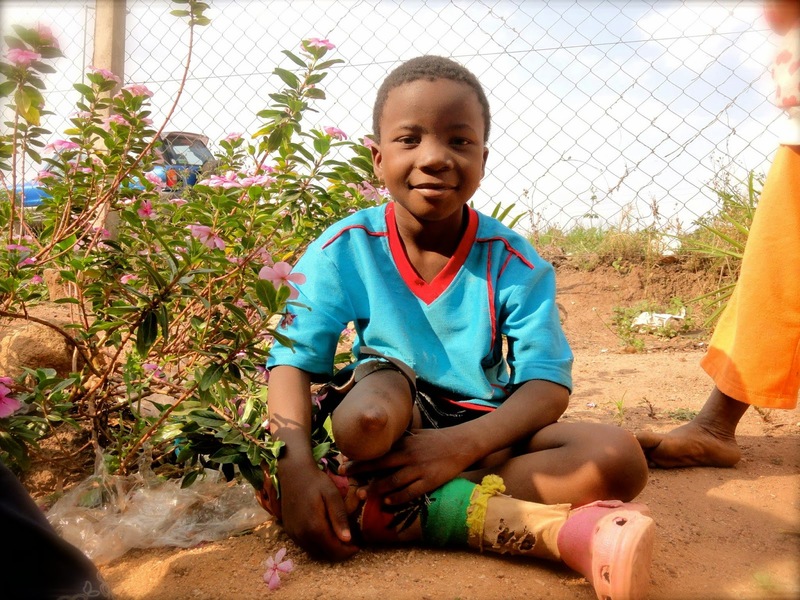 I was again reminded that in some ways I need Swaziland as much or more than it needs me. This little girl, living in some of our planet's harshest surroundings, reminded me that life can't do more to than we let it. The hand we are dealt may not be easy, but it's ours to choose how to play out. We can be knocked down, but even with just one leg, we don't have to be knocked out. The relationships we build are worth much, and many times all we really need is to be seen. In Matthew 25:31-46 Jesus talks to us about our responsibilities with what we have seen. "Whenever you failed to do one of these things to someone who was being overlooked or ignored, that was me - you failed to do it to me." He is clear, he wants us to give to those in need. My prayer is my eyes would be open to see the needs I can fill and that I would faithfully act when I see the needs of Jesus.